Fast performance with a 7nm A12 Bionic chip. 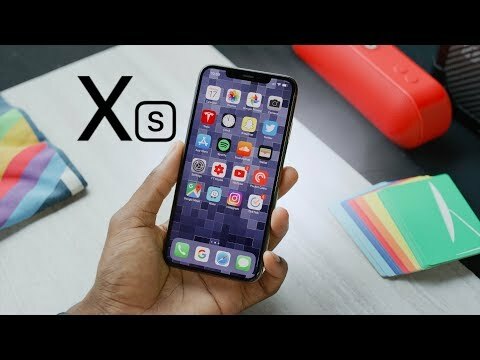 Apple did not do a great job with iphones this time although the XS has an OLED display and a processor which can beat the performance of a laptop it isn&apos;t that great. The price being almost a lakh it does not support fast charging, the battery life is not that great too and still no external storage. The latest smartphone which was launched recently. It looks amazing in those different color options. It has an Apple brand tag so you can flaunt it. The design is attractive. It is slim and lightweight. Coming to cameras, the device clicks amazing shots just like a DSLR. the battery life is very poor though. Apple iPhone XS looks very beautiful due to the various color options. It has a wireless charging support which is great. The display on the front is very bright and vivid with the immense viewing experience. Overall a great device but poor battery backup though. It is also overpriced. The iPhone XS is a recently launched flagship smartphone which looks very attractive due to lots of color options. It has a powerful processor that can handle any task thrown at it. The device has literally one of the best cameras. You can click some of the amazing shots with a single tap. That&apos;s pretty impressive. It has an Apple brand so it is enough reason for getting it plus a dual sim now. The best camera, best performance, best battery and best software. It is expensive but worth every single rupee spend on it. I like iOS very much - It is clean and light. iPhone XS is very lightweight and slim smartphone just the way I like it. I used this device for around 7 days. I got it as a gift from my brother. The smartphone, even though feels premium, was not what I was looking for. I was looking for a device which is customizable and iOS is not great for that. Also, I don&apos;t like the camera that much. The detailing in the pro mode was not that great. 20 Pricebaba users have written their experience with Apple iPhone XS. If you own Apple iPhone XS, please do leave your feedback too. Lowest price of Apple iPhone XS price in India starts at Rs. 98,714 Apple iPhone XS is available on Flipkart at Rs. 99,900 and on Amazon at Rs. 99,900. Prices updated on 25th April 2019. Marking the end of the home button and its fingerprint sensor, Apple iPhone XS has heralded a new era of smartphones. Here’s a glimpse of a few amazing features that make iPhone XS a perfect choice for Apple admirers. With a striking curved design, iPhone XS features a screen resolution of 2436×1125 pixels and 14.73 cm (5.8-inch) OLED display. iPhone XS has a water resistant and a dust proof display with a sleek and elegant design. The phone’s 3D touch makes the functioning smooth and extremely efficient. Having a 12MP +12MP rear camera, the device offers exceptional picture quality and zoom capacity. The front camera is 7MP, which makes way for wonderful portrait selfies. Flaunting its A12 Bionic chip, iPhone XS is all set to provide faster performance than previous A11 Bionic processor. The 7nm A12 Bionic chip has 6.9 billion transistors and 4-core GPU for an enhanced experience. Its 6-core CPU is 40% more power efficient and 50% faster than the A11 Bionic. With storage models of 64GB, 256GB, and 512GB, the device eliminates the need for an external storage device. The 2658 mAh Li-ion battery empowers iPhone XS with improved battery performance and life. The phone supports 4G-LTE, 4G, Wifi, USB, Bluetooth, and GPS connectivity. It is the first dual-sim iPhone launched by Apple. The phone is powered by iOS 12, which focuses on enhanced and better performance, parental controls, AR quality, digital health functions, and Memoji.